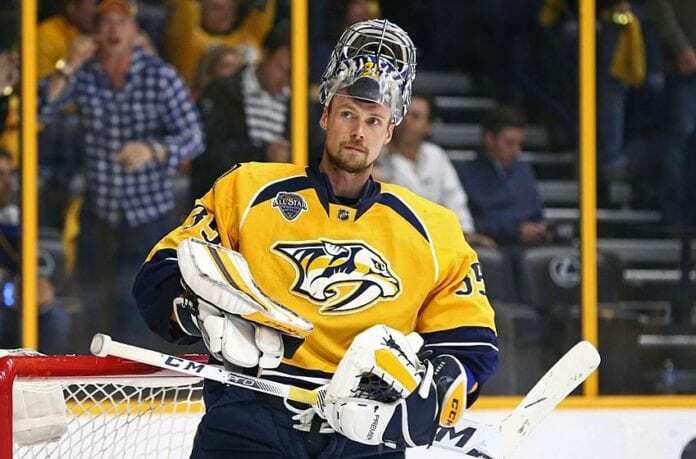 The erratic play of Vezina Trophy Finalist Pekka Rinne was one of the areas that resulted in the Predators being eliminated by the Winnipeg Jets in the second round of the Stanley Cup Playoffs. Rinne had two great road games, but had a horrendous time in the four home games. The Nashville Predators now look ahead to the 2018-19 season in the wake of their disappointing second round elimination at the hands of the Winnipeg Jets last week. The Predators truly felt they had a great shot at beating the so-called “President’s Trophy jinx,” but instead became the fifth straight team (and ninth of 10 overall) to lead the NHL in points during the regular season, then bow out of the playoffs without winning the Stanley Cup. Now there are questions to be answered in the offseason in all three major phases of the Predators’ operation, beginning with the goaltending. Prior to the start of the Winnipeg series, that position would have easily been considered not just a strong suit, but arguably the strongest part of the Predators defense. Pekka Rinne’s regular season performance was good enough to earn him a Vezina Trophy finalist slot, and many feel he will win it when the awards are announced next month. He was good, though not great in the opening series, but seemed to have put any problems behind him in the Game 6 clinching win in Colorado. Then came Round 2 and disaster. Rinne played superbly in Games 4 and 6 on the road, but was erratic in Game 1, outstanding during the third period and two overtimes of Game 2, and then a disaster in Games 5 and 7. No one has any explanations for why a goaltender who was so magnificent at home throughout the regular season was awful during much of Round 2, but that’s what happened. While few outside of some folks carping on Twitter expect him to be traded or released before next season, he will turn 36. Juuse Saros has been billed as the “goalie of the future,” and it will be interesting to see how much work he gets in the early going next year. The Predators have steadily refused to trade any of their top four defensemen. But that group wasn’t at its best against Winnipeg either. Neither Captain Roman Josi or Ryan Ellis, expected to sign a big new contract, scored a goal against the Jets. While the team’s first line was mostly excellent, the second one with Kyle Turris centering for Kevin Fiala and Craig Smith were invisible against Winnipeg. Smith had zero goals. Fiala had one spectacular game winner in the double overtime contest, the only home game the Predators won in the series. But by Game 4 he had been scratched. Turris had just three assists in the two rounds. Now there was speculation on NBCSN that one of big four will be traded to get another top scorer. There was no comment on that from David Poile. Lastly, the biggest mystery will be how a team that went 9-2 in the playoffs at home last season went 3-4 this year with better talent and more depth. They were also outscored 19-9 in the last four home games. Those two statistics, and the reasons for them, will be examined the most over this offseason.